At the 2018 CSUN Assistive Technology Conference last month I had the wonderful opportunity to present with Microsoft lawyer Sue Boyd. Our session was titled Beyond Compliance: Staying Out in Front of Digital Accessibility Legal Trends. Our talk focused on the ingredients needed to bake accessibility into an organization. The audience even got homemade chocolate chip cookies to drive home the theme. 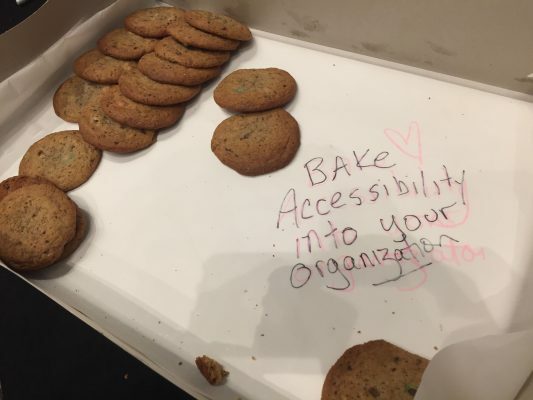 Those yummy cookies were chock full of chips, M&Ms, and other goodies to signify the many roles involved in making accessibility a truly integral part of any organization. And of course the cookies were sweet. An accessibility program driven by fear of lawsuits or compliance reviews may deliver short term results. But accessibility is about people — disabled people who you want to participate in your organization as employees and customers, and the entire organization full of people who you want to encourage to contribute to – and benefit from! – an inclusive environment. This post shares the ingredients that Sue and I discussed. You can also check out the slides for the Beyond Compliance presentation. This is the second post on this website following the 2018 CSUN Assistive Technology Conference. You may also want to read the post-conference wrap up of the Digital Accessibility Legal Update session. As with all posts on LFLegal, nothing written here is intended as legal advice. A few months ago I read Microsoft CEO Satya Nadella’s book, Hit Refresh: The Quest to Rediscover Microsoft’s Soul and Imagine a Better Future for Everyone. The book is a fast-paced glimpse behind the curtain to understand the man widely credited with leading Microsoft’s re-emergence as a globally relevant and forward thinking company. A key take-away from the book is that Microsoft was able to shift its corporate culture to one focused on people. Part of that shift has been a renewed and deep commitment to accessibility. Culture Change was the first ingredient of a baked in accessibility commitment we offered our audience. In our presentation Sue talked about how that culture change takes place, recognizing of course that change is never linear, that it is constantly evolving. How is Microsoft growing a culture where accessibility matters across the board? Leadership from the top, as Nadella’s book teaches, but also responsibility from the bottom. No matter what role (chocolate chip or M&M!) accessibility is in the hands of so many. Culture change toward inclusive products and services at Microsoft also flows from a diligent focus on people. In my legal updates I remind people that the only reason the law is even involved in digital access is because accessibility is a civil right of people with disabilities. How can large organizations keep people with disabilities front and center as part of the culture shift? Partner with employee resource groups comprised of disabled employees, and, as Sue wrote on our slide deck “Get out of the Office.” Do community events with the disabled community. Come to (and sponsor) conferences like CSUNATC. Know the people you are designing for. The importance of corporate decision makers, web developers, and others responsible for accessibility knowing disabled users has been central to the success of Structured Negotiation. In Structured Negotiation, people with disabilities can meet with organizational leaders and staff without being forced into the limited role of “plaintiff in a lawsuit.” Time and again I’ve been told that even one meeting with our clients was able to catalyze a culture shift — an opening that can allow the practices at play at Microsoft to take root and flourish. I’m embarrassed to say that I never considered inclusive hiring an ingredient of a digital accessibility program. Of course, I knew that hiring people with disabilities is a critical component of diversity, equality and opportunity. But a part of making a website accessible? A mobile app work for everyone? Sue reminded the audience (and me!) that inclusive hiring is a key ingredient for staying ahead of the legal curve. When a designer knows that the person one cubicle over is color blind, it is more likely that accessible design choices will be made. If a manager knows that a team member won’t be able to read an email sent without accessibility, an accessible email program will soon be part of the mix. And of course, workers with disabilities come with their own set of unique skills, many earned through creativity needed to navigate through life — and a too often inaccessible world — with a disability. Those skills can contribute directly to the creation of accessible products and services. Sue Boyd and I are both lawyers. But even if we weren’t we’d have to say that the legal and compliance side of accessibility is a key ingredient for an organization committed to inclusion. Know the laws, regulations, and policies that impact your organization. Keep up to date — but not overwhelmed — by legal developments. And remember accessibility laws and policies are global. But keep legal compliance in its rightful place as one ingredient in building a culture of accessibility. Too much focus on the law will lead to a cookie that isn’t so sweet, while ignoring the law will leave a bitter taste. Use all the ingredients and check against legal requirements. Always remember that the laws are there to make sure the digital world includes people with disabilities, not as a random or unfounded set of rules. As Sue pointed out during our session, settlement agreements reached in Structured Negotiation include a provision about training staff whenever possible. Why? Because poorly trained staff are the cause of many legal actions that could be avoided. When a 45 year old blind woman is told to have her sighted mother read a confidential financial document when it is not accessible on line, her first thought is not to call her mother. It is to call her lawyer. An organization’s commitment to accessibility doesn’t mean much if the people who need to know don’t. Training must of course be geared to job responsibilities. Coders must be trained to code to international accessibility standards. People who answer phone calls and emails must understand that not everyone uses a mouse or hears video content. Most importantly, they must know how to escalate accessibility concerns to someone who can promptly and knowledgeably respond. A large organization like Microsoft has training departments, teams, and protocols. But even the smallest organization must make sure all staff know about how people with disabilities use products and services and access information. And hiring a disabled trainer is all the more impactful. Sue and I almost forgot design and coding when we put together our slide deck! We think that happened because there is so much attention paid to international accessibility standards that it goes without saying that developers and designers must know how to design and code for accessibility. This is a key ingredient, but not the only one. Like law and compliance, a sole focus on standards can cause an organization to skip the other aspects of inclusion that hold the cookie together. Testing is a critical ingredient of an accessible company. I sometimes hesitate with the word “testing” and it’s pass/fail connotations, which can be de-motivating. But vocabulary aside, how can we know where we’re going if we don’t know where we are? How do we know how far we’ve come or what’s left? There is no one-size fits all for a testing program, but there are some basics: An automated scan is never enough; human checking is essential. So is usability testing by disabled people. As our ingredient list in our presentation stated, “And Always Put People at the Center.” This may be most essential for the testing ingredient. Today there are a ballooning number of testing tools and vendors offering testing services. Too often I’ve seen companies faced with a legal action, or even a possible one, rush out and spend money on a testing program that doesn’t meet their needs or fit their corporate culture. Choose accessibility vendors as you would any other vendor — with care. Interview more than one vendor, check out more than one tool, and gain an understanding of the marketplace and offerings. Choose the tools and/or the company you need at a cost that fits your budget. To learn more about testing as an ingredient in an organization’s accessibility program, check out the 2018 ICT Accessibility Testing Symposium: Mobile Testing, 508 Revision, and Beyond, happening later this year, where I’ll be delivering the keynote. Transparency is a value at both Microsoft and at the Law Office of Lainey Feingold. Yes, there is risk in being transparent about accessibility efforts, but Sue explained at our session that Microsoft believes the risk is outweighed by the benefits of highlighting the organization’s accessibility journey and accomplishments. The Microsoft Accessibility portal is a model for other organizations to emulate. Microsoft’s accessibility blog showcases the impact of the company’s efforts and allows the public to better understand what the company is doing and why. The seeming ubiquitous presence of the company’s Chief Accessibility Officer Jenny Lay-Flurrie puts a face on a global company’s accessibility efforts. I believe in transparency too. The digital accessibility work my clients, co-counsel, and I have done for the past 23 years affects hundreds of thousands of people I have never met. Those people deserve to know how the law is being used in the cases we’ve negotiated in Structured Negotiation. I am grateful to my negotiating partners who have not insisted on confidentiality of our settlement agreements. Transparency is also why I maintain a growing list of organizations with Accessibility Information Pages. When a potential client calls me to talk about an accessibility barrier at an organization, the first thing I do is check to see if the company has an easily findable page. It doesn’t mean the site will be perfect. It means that at some point, someone understood that people with disabilities would be using the site, mobile app, or other technology. That matters in deciding the appropriate strategy to get the barrier removed as quickly as possible. Accountability is the last ingredient we talked about, and one that infuses all the others. Developers and designers must take responsibility for putting out clean and accessible code and design. Training managers must recognize that training on how disabled people use technology, and how the organization handles accessibility feedback, could be the difference between a satisfied customer or a legal complaint. Instilling accountability in the many roles that impact a truly accessible company the size of Microsoft is impossible without the culture ingredient. It is easier to achieve when the ingredient of inclusive hiring is robust, because employees are not just accountable to a principle, they are accountable to their fellow-workers. And accountability depends on what every ingredient depends on: keeping people front and center. The people with disabilities who will be included in an organization and it’s offerings when accessibility is baked in. There were many reasons I loved doing this presentation with Sue Boyd in the Microsoft suite during the CSUN AT conference. First, it was great getting to know Sue, who I didn’t know before this, and who is committed and focused yet so easy to work with. Second, as someone who usually presents by herself with no support staff, it was exhilarating to have someone responsible for the slides, someone to develop content with, someone to bounce ideas off of and learn from. But these things are minor compared to the main reason this session was important to me. Microsoft has over 120,000 employees across the globe. To learn more about its commitment to accessibility, and to hear that culture really can change to a more inclusive accessible one gave me hope. Hope that accessibility won’t just become an issue of compliance, spurred by fear of lawsuits. Won’t be reduced to a “practice area” for lawyers on “both sides” looking for the new next thing. Fear alone is never a good motivator. The ingredients that Sue Boyd and I shared with the #CSUNATC audience work far better to create an organization where accessibility is — and remains — a core principle because people are core to every organization. Inclusion and accessibility should be sweet, just like the cookies.